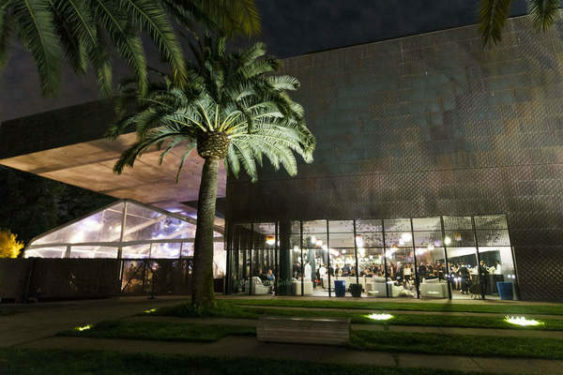 In partnership with the Consulate General of Mexico in San Francisco and LAM, Friday Nights at the de Young joins in launching MEX I AM: live it to believe it. This multidisciplinary festival, the first of its kind in the Bay Area, showcases the best performing arts, culture, and ideas from Mexico from July 31 to August 5. A world of art awaits you at the Fourth Annual Fair Trade Bazaar showcasing products from global artisans. Shop for unique items including jewelry, textiles, native handcrafts, and decorative accessories reflecting the many cultures represented in the museum’s collection. Members receive a 10% discount. Tools of the Trade: Experiment with artist tools used to make paints. Concoctions: Make your own art concoction. Contribute to a community mural inspired by tonight’s theme and artist Favianna Rodriguez. Conversation Station: Exchange ideas with fellow Friday Nighters. Tonight’s theme is “MEX-I-AM.” Who are you? Los Cenzontles (“The Mockingbirds” in Nahuatl) dig deep into Latino traditions, bringing Mexican traditions to new generations. Pioneering a powerful new hybrid sound and creating a fresh Chicano voice, the group also promotes cultural pride and understanding. Enjoy a performance by acclaimed flautist Horacio Franco from Mexico as a preview of the MEX I AM: live it to believe it festival, which celebrates the arts, culture, and ideas of Mexico. Franco is a master of his instrument and one of the most highly recognized musicians in Mexico. He studied at the National Conservatory of Mexico and the Sweelinck Conservatorium of Amsterdam. In addition to his activity as flautist and musical director, he has participated in many educational programs for underserved communities.